The classic Paint app wasn’t supposed to be part of Microsoft’s modern Windows 10 experience, so the company announced a long time ago that this little tool would just go away and make room for the brand-new Paint 3D app. As a way to ease the transition, Microsoft originally intended to publish the classic Paint app in the Microsoft Store, thus allowing users who still wanted to install it to do so even if the feature was removed from Windows 10. 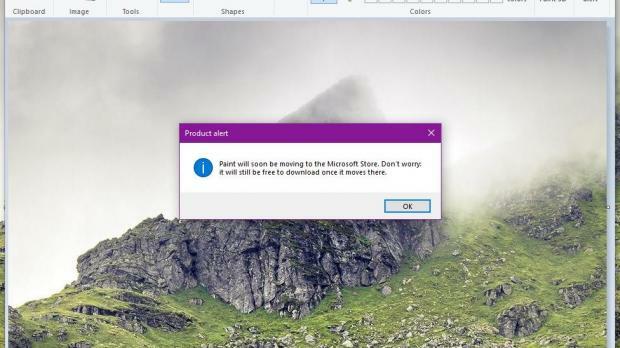 In the meantime, an alert included in Paint warned users that “this version of Paint will soon be replaced with Paint 3D. Classic Paint will then become available in the Store.” This way, Microsoft wanted to make everyone aware not only that the classic Paint app is going away, but also that a new, more capable replacement was available. And surprisingly, these plans might have changed, as the product alert implemented in Paint has recently been removed.Paint making the cut?As AL noticed, the warning is no longer there in the Paint app in the most recent Windows 10 19H1 preview build, which is already in an advanced development stage. Windows 10 19H1 is projected to be finalized next month, with the RTM to be shipped to insiders for the last round of testing in late March. So with this Windows 10 version already close to completion and the Paint warning removed, many believe the company might, after all, keep the app around for a little longer. But then we just have to wonder why Microsoft will continue to offer two different Paint apps in Windows 10, especially because they would just cannibalize each other and make matters more confusing for beginners. We’re still waiting for Microsoft to set thing straight in this regard, and we expect more information on the future of Paint to be provided when the next preview build ships to insiders. many believe the company might, after all, keep the app around for a little longer. Paint is a small application for basically simple image producing and manipulating and it has been part of Windows since it's earliest versions. It makes no sense to replace it for some more complicated app; those who use it, will miss it and a more "complete" would be still rather primitive for professional purpose.